Blue, black or white exhaust. A knocking noise coming from your engine. Reduced acceleration, with or without a hard start. These are only a few signs it might be time to overhaul your heavy-duty Mack® truck’s diesel engine. Because even legendary durability may need a reboot over time. Never fear. Mack’s got your back with four different levels of overhaul service to restore your engine's power, reliability and operating efficiency. Nobody knows how to revitalize your engine better than the people that built it in the first place, and we do it with all Genuine Mack parts, designed to work precisely with your engine. No compromises. Our Level 1 BASIC and Level 2 PLUS overhaul options do the job in the most affordable manner. Mack BASIC and PLUS In-Frame Overhaul kits include six piston kits, six cylinder liner kits, a main bearing set, rod bearing set, cylinder head gasket set, lower engine gasket set and upper engine gasket set. In addition to all that comes with the BASIC Overhaul kit, the PLUS kit includes REMACK® cylinder heads. Both are installed with Mack filters, Premium Oil and coolant. The Mack Level 3 PREMIUM overhaul package restores your engine to its former glory. With a PREMIUM package, you get everything that comes with a BASIC or PLUS package, along with a Mack Turbo kit and a set of six Mack injectors. Going with a Level 4 REMACK engine gives your truck a second life, with all the reliability you’ve come to expect from Mack. REMACK engines are remanufactured by Mack-trained technicians after stringent processes that include internal and external cleaning; bead blasting to remove contaminants; electro-magnetic crack detection; pressure decay testing of the oil and coolant systems; vacuum testing of cylinder heads at intake and exhaust and replacement with new parts of all piston rings, liners, bearings, bushings and gaskets. A Mack Level 4 REMACK engine is installed with a Mack Turbo kit, a set of six Mack Injectors, and Mack filters, Premium Oil and coolant. Engine overhauls are typically performed every seven to 10 years, or every 800,000 to 1 million miles. 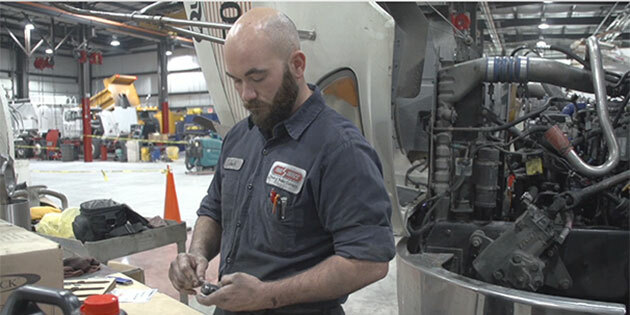 If you’re nearing that mark, check with the factory-trained technicians at your nearest Mack Trucks dealership to see if an overhaul is the right move for you. The Mack Level 3 PREMIUM overhaul option and Level 4 REMACK engine each come with one of the best warranties in the business – 3 years/350,000 miles when dealer-installed. The 3 years/350,000 miles warranty is available for an additional fee when your dealer performs a Level 1 BASIC or Level 2 PLUS overhaul on your truck.